Twenty eighteen has been a year of centenaries. The Royal Air Force celebrated its 100th anniversary with a memorable fly-past demonstrating a thrilling unity of purpose and execution. We owe them and all our Armed Services our deepest gratitude not least for which is the Royal Navy’s gallant defence of our shores from the monstrous Kraken, who betentacled evil so threatened our shipping in Eighteen eighteen. Many young people today will only be familiar with more modern threats to our island home or to the many nations of the commonwealth. My own grandson His Royal Highness The Duke of Sussex prefers to call such creatures ‘kaiju’ but in the long traditions of my family, I prefer to see such monsters as part of a tradition that dates back to the times of Grendel and dragons. I have with me today, my dear, dear friend Timothy the Talking Cat. Timothy is a welcome source of comfort and advice to me in these troubling times. To reduce the malign psychic influence of the Satsuma Spider God, Timothy will be playing some distracting tunes on the enchanted piano behind me. This piano was carefully built by a Masonic cult led by Mozart and the re-animated corpse of Doctor John Dee. We would like to take a moment to once again thank Doctor Dee for his continued service to the monarchy despite his death several centuries ago. The piano’s strength lies in the bonds of affection it promotes, and a common desire to live in a better, more peaceful world. Even with the most deeply held differences, treating the other person with respect and as a fellow human (or otherwise) being is always a good first step towards greater understanding. Indeed, the Commonwealth Games, held this year on Australia’s Gold Coast, are known universally as the Friendly Games because of their emphasis on goodwill, mutual respect and capacity to band together to ward off the “Seven Plagues of Brisbane”: giant mutated sea-turtles, a tropical cyclone full of sharks, undead cane toads, a cyborg Elon Musk angry at the horror of his own existence, a supernatural beer shortage, the ghost of Harold Holt covered in seaweed and the impending spread of high house prices from Sydney. Some may say that the numerous banes, blights and Brexits impreliling our realms are simply the psychic backwash from the spiritual sceptic tank of British Imperial history, rising up from the underworld like a backed-up sewer, seeking to overwhelm our land with centuries of repressed and revised history transformed into phantasmagorical creatures. To that I would reply that those critics who make such assertions have never truly seen the darkness that I have when I first gazed upon the entity that we have locked and warded in the huge cavern beneath Balmoral. There are those who would contend that the monarchy is out of touch or an institution of a bygone age whose time has passed. To those of my subjects who find themselves so sadly deluded about the true nature of reality let me ask you this. When the creatures of the void break through the veil of cosmogyny and come to rend your essence from your bones and then marke sport with your skeleton while your howling soul looks on, to whom would you turn? Your milquetoast post-modernist professors? Your “Jeremiah Corbills”? Your “republicans” and constitutional reformers? Or instead will you turn to a family that are the heirs to Boudicca, King Arthur, William the Conqueror, or my namesake Glorianna herself Elizabeth the First? A family who’s every scion is sent to brutalizing residential schools and then forced into military service? A family that has hoarded every single object of eldritch power from every corner of the Earth into the world’s greatest thaumaturgical armoury? Yup, thought so. You cling to us because like the cowards you are you know we are the one thing that stands between you and the horrors beyond. Now let the smoothing music lull you back into a slightly disgruntled aura of obedience. These words will seep into your subconscious and all you will remember is some bland words of togetherness. I have to say that the parallel universe from which this Christmas address hails sounds more interesting than ours. Plus, Timothy’s royal purple fits in well with Her Majesty’s surrounding. That said, when I first saw this still of the Queen doing her Christmas address (sans Timothy) in my Twitter feed directly after a still of German president Frank Walter Steinmeier doing his Christmas address, the first thing I noticed was that the Queen has a much better Christmas tree than Steinmeier, who is stuck with the same straw star and red balls decoration that has been in the background of every German Christmas address for as long as I remember. I suspect they are constitutionally required to use those decorations year after year after year. I recall one year where my eyes were riveted on that tree with its live candles, wondering what would happy if it were to catch fire. Unlike Steinmeier, Queen Elisabeth II also has a lot more gold, a fireplace sprouting flowers, and grand piano and a neat gold and ruby broche. She also looks a lot better than Steinmeier, even though she’s 30 years older than him. And I actually like Steinmeier. The Queen doesn’t seem to have aged in the last 10 years. Maybe she’s a vampire? Or Doctor Dee is keeping her ageless with his magicks? But, c’mon, Xmas trees are German to begin with, he ought to have something nicer. I strongly suspect that part of the reason they have those badly placed live candles is to keep people watching because they’re wondering when the tree is going to burst into flame and set the flag on fire. After all, we still remember the Helmut Kohl new year’s address fiasco from 1986, when someone at the TV station got the tapes mixed up and the previous year’s new year’s address went out to millions of TV viewers and absolutely no one noticed. I actually watched the 1986 new year’s address live, bored out of my mind in a country house with friends of my parents I didn’t like, and noticed that Kohl wished viewers a happy 1986. And I said, “Hey, he’s so stupid that he even got the year wrong.” (Helmut Kohl was widely considered stupid, but harmless at the time. Sadly, he was cleverer than he looked and actively malevolent). That said, the sameyness of German presidents’ Christmas addresses is staggering. Here is Steinmeier’s predecessor Joachim Gauck: http://www.bundespraesident.de/SharedDocs/Bilder/DE/Termine/Joachim-Gauck/2016/12/161222-Weihnachtsansprache.jpg?__blob=normal&v=7 Same tree, same flag, same position, different old dude. Here is Gauck’s predecessor Christian Wulff: http://www.bundespraesident.de/SharedDocs/Bilder/DE/Termine/2011/12/111225-Weihnachtsansprache4.jpg?__blob=normal&v=5 Same flag, same straw stars, but white balls instead of red (!) and a different position for the tree (though candles and curtains don’t mix). This wide angle shot is even more shocking: http://www.bundespraesident.de/SharedDocs/Bilder/DE/Termine/2011/12/111225-Weihnachtsansprache.jpg?__blob=normal&v=3 There is a live audience. And it’s pretty diverse looking, too. Wulff’s attempts to enliven the dull Christmas address with a live audience were widely criticised. By the next Christmas he was out of office, quitting over the world’s most depressing corruption scandal. Here is Wulff’s predecessor Horst Köhler: http://www.bundespraesident.de/SharedDocs/Reden/DE/Horst-Koehler/Reden/2004/12/20041224_Rede_Bild.jpg?__blob=poster&v=2 Same tree, same decorations, same flag, but a different position. Plus, he is sitting behind a desk and has a seasonal flower arrangement. There’s even a bit of gold visible. This was obviously too shocking as well, because Köhler was out of office soon thereafter, quitting because people were mean on the internet. 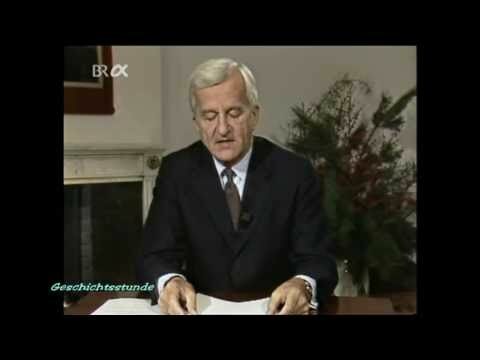 Here is the guy before Köhler, Johannes Rau: http://www.bundespraesident.de/SharedDocs/Reden/DE/Johannes-Rau/Reden/2003/12/20031225_Rede_Bild.jpg?__blob=normal&v=2 Silver balls, no straw stars and electric candles. Plus, Rau has brought along his wife and is pretending to decorate his own tree. Shocking. How did we survive? Herzog’s predecessor Richard von Weizäcker: https://i.ytimg.com/vi/bk0f2mbTpr4/hqdefault.jpg A desk and a very dead looking tree without decorations. This is the earliest image I could find (from the 1980s). I couldn’t find any photos or footage of the earlier guys doing Christmas addresses. Come to think of it, we have gone through a lot of presidents, though chancellors tend to stick around forever. Oops, I just posted a comment that landed in the spam bucket due to too many links. Thanks. It was getting a bit lonely in there with only Phantom for company. Steinmeier’s Christmas tree is a real tree, looking a bit scraggly and uneven like firs normally do. Elisabeth’s tree look like an artificial cone of green, silver and gold stuff. Also, with live candles the tree must be a bit scraggly, or it becomes impossible to place the candles so they don’t set fire to the branch above. You definitely need a scraggly tree for live candles. Ours is usually a lot more scraggly than Steinmeier’s, since it’s from our own garden and not the cream of the crop at the Christmas tree farm. Elisabeth’s tree probably is artificial, though it’s too far off to tell for sure. I am absolutely certain Harry and Meghan do call them kaiju. Her Maj leads a much more interesting life that I knew about! No wonder Bob Howard and Peter Grant carry on the good old British traditions. But she’s gracious about remembering those who came before, like Dee, and well-informed about the former colonies, like the Brisbane plagues and the Satsuma Spider God. the entity that we have locked and warded in the huge cavern beneath Balmoral. “the entity”? I know that the queen can do as she wants, but I don’t think that’s a proper way to talk about your own great-great-grandfather, prince Albert.